It’s easier than you might think to eat nutrient-dense leafy greens. I understand how intimidating bunches of kale, chard, and collards can look on those grocery shelves. Hey, I grew up eating iceberg lettuce – correction, I grew up eating a lot of junk – and the ONLY lettuce I ate was some iceberg drowned in “Thousand Island Dressing”! So, I get it. I was also initially daunted about buying, cleaning, prepping, eating, and cooking greens. But now I love them, and buy heaps of kale and collards every week – and grow chard and kale in my garden in the summer. So I’m here to tell you—it’s doable. 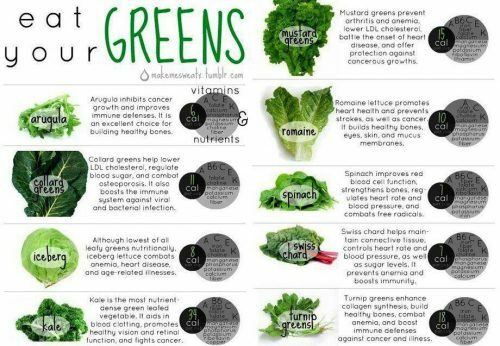 There are VERY good reasons to include more leafy greens in your diet. They are packed with vitamins, minerals like iron and calcium, antoxidants, fibre, phytonutrients and chlorophyll. They are also a source of omega-3 fatty acids, have anti-inflammatory properties, and help the body detoxify! This “Leafy Greens – Ranked and Rated” article from Jill Nussinow, MS, RD, details quite a lot of nutritional highlights and health-protective qualities of leafy greens. Admittedly, it does take some time to get used to using and working with greens, familiarizing your palate with their flavors, and making them an everyday part of your diet if you are unaccustomed to them. Children especially notice the bitter notes of dark greens, so it is more challenging for them. But, like introducing other foods to children, repetition is key to acceptance. And for the adults, before long you’ll find yourself looking to eat more greens, actually loving them and wanting to have them at more than one meal. At least, I have. And, you might not love them all… but I hope to help you find at least a few new varieties to enjoy! So today, I want to help give you that “leafy-green-vibe”! I will outline tips for buying, prepping, and cooking/eating different varieties of leafy greens. I won’t touch on ALL the types of leafy green goodness available to you… but you’ll have enough not to make ANY excuses! First, when buying greens, make sure they are very fresh. Look for vibrant dark green leafies that are crisp and full, not wilted or yellowish. And, go organic when possible. Non-organic spinach, kale, and collards are high in pesticides. Certain vegetables are worth buying organic, and greens are one of them. In general, lettuces (romaine, red leaf, green leaf, butter, etc) and considered milder and sweeter tasting. Spinach is a step up in bitterness from lettuces, with what some might describe as a ‘mineral’ flavor, but still less bitter and pungent than many leafy greens so easier for children (and many adults!) to eat. Swiss chard (all colors) and beet greens taste a little more “assertive” with a slight ‘salty’ undertone. While some like to eat them raw, you may prefer to cook them very lightly to balance that salty flavor and slightly chewy texture. Collards and kale having a stronger ‘cabbage’ flavor as part of the cruciferous family, but also have more absorbable iron and calcium than chard, spinach, and beet greens – so they are excellent greens to include in your plant-powered diet. There are also quite a few varieties of kale with different taste profiles. Curly (sometimes called green) kale is most common, and some think it has the mildest, most easily accepted flavor. Then there is lacinato (or dinosaur or black) kale, and while it has a stronger flavor, I quite like the texture and look of dino kale! Purple or ‘red russian’ kale is also available, and it has a slight floral undertone. Kale works well raw in smoothies and salads (as we will discuss), but also lightly cooked in different entrees. Then there are other “spicy” greens such as arugula, and mustard, and dandelion greens, which I like to say are more aggressive than assertive. Their flavors are strong and peppery, with some heat or bite, and so they aren’t always accepted by younger eaters – or adults. Finally, we have the fresh leafy-green herbs, which are often forgotten when discussing leafy greens. Fresh parsley (flat-leaf or curly), cilantro, and basil are also bursting with nutrition… and also flavor! I eat fresh parsley daily, adding it to smoothies or wraps or salads – I’ve come to love it. 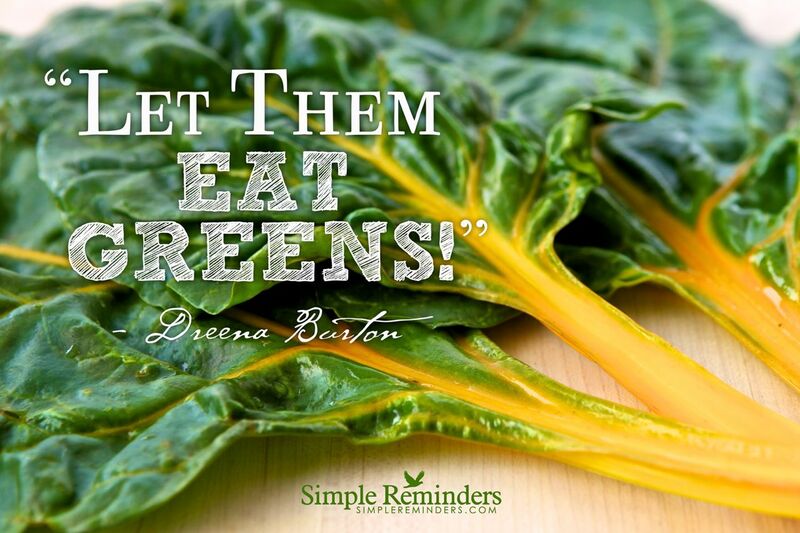 And, it’s one of the most nutritious greens, as Heather Nauta explains in this post and video. Find that parsley love! Younger, more tender leaves from all greens are typically a little sweeter than more mature, robust leaves. I prefer to use mostly spinach, chard, collards, and kale, as they are best accepted by my whole family, but if you like those peppery greens, by all means, rotate them as much as the others. Kale and collards are also hardier greens, so I find that they are often fresher in the store, and refrigerate better. But some days the chard is the freshest at the store—or the spinach… so shop with freshest in mind. After buying your greens, keep them refrigerated in a plastic bag (unless already packaged). If they aren’t in a plastic bag, they will dehydrate quickly and become limp. When you are ready to use your greens, give them a good wash! Get them submerged in a sinkful of cool water (unless you’ve bought triple-washed spinach, which just needs a quick rinse and salad-spin). Separate the leaves, and agitate a little with your hands to remove any soil and debris, and any bugga-buggas! Kale especially can house little critters, so get a good wash through those leaves. Then shake off the water and transfer the greens to a salad spinner. You can use other methods to wick away the water, but I find a salad spinner most effective. Spin until mostly dry, then you’re ready to use them. If not using right away, whisk away as much moisture as possible, then refrigerate. I keep lettuces/spinach in my salad spinner. 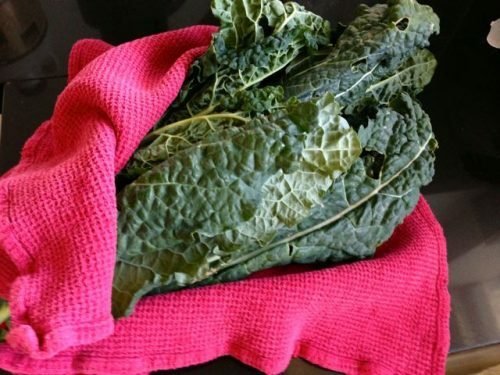 For hardier greens like kale and collards, I lightly wrap in a clean tea towel and then pop in a ziploc bag, leaving it open. This helps keep the leaves from drying out but also not getting wilted from excess moisture. If you want to freeze greens like kale and collards for smoothies, you can do so (I prefer them fresh, but it’s up to you). Remove the leaves from the stems (as described coming up), tear in pieces, and store in ziploc bags to freeze. oh-so-cozy kale, ready for a ziploc bag to chill out! For sturdy greens with tough stalks (e.g., kale, collards), you will want to remove the leaves from the fibrous stalk. You may even want to remove some of the lower portion of stalks from chard and larger spinach leaves (not from baby spinach), where it becomes thicker and more fibrous. You can do so by “stripping” the leaves. Hold the base of the leaf at the stalk in one hand, and then using your other hand, run your fingers from the base of the stalk to the tip to strip off the leafy portion. You can then discard the stalks—or use them in stock bases, if you make homemade vegetable stock. Now that you have the leafy portion, you can use them whole for smoothies or sandwiches, or chop some more to use in salads or soups, for instance. I like to julienne leafies for salads, and roughly chop them for soups or sautés. You’ll get the feel once you get going, based on how you want to use the greens, how large the leaves are, how tender, how bitter, and so on (applications follow!). • Green Smoothie. 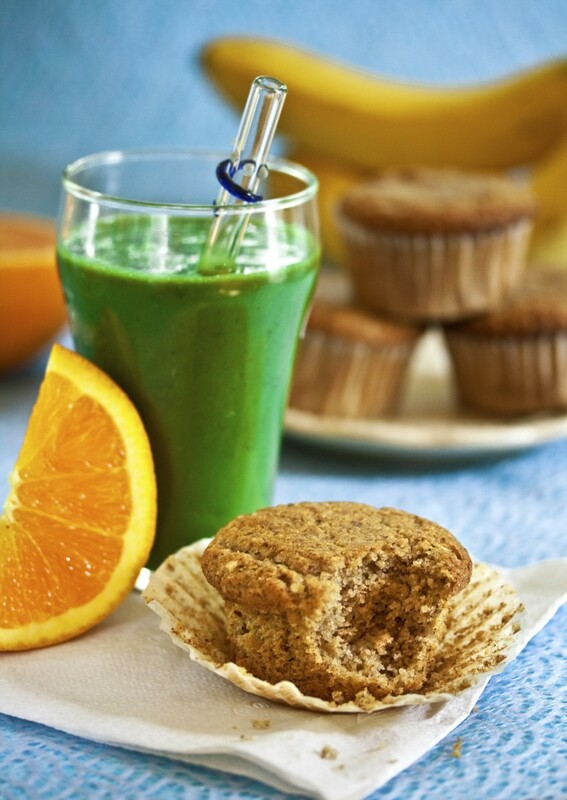 The almighty green smoothies—they have changed my life, and my morning routine. I swear they are the most efficient, easiest way to eat greens– and probably the most delicious way to eat them raw. In Let Them Eat Vegan I have an entire green smoothies tutorial – with tips to help you make them taste delicious, and to balance the components so they aren’t too fruit-heavy (but also not too bitter). Check it out, it’s ‘Go Green’ with Smoothies,” starting on p.26 of LTEV. You can get started with my “Apple-A-Day” Green Smoothie! And, you can read more about the goodness of green smoothies in this post from Julieanna Hever, MS, RD. • Salads. I know salads seem obvious, but some tweaking might be needed here. See, some greens such as spinach and chard are milder in flavor. Many of us have had a spinach salad, for instance; no big deal. But have you ever had a kale salad? That’s a different story. Some greens are bitterer than others. Kale is one of those greens, and chard to a lesser extent. So, when adding rich, dark leafy greens to a salad, chop them finely and mix with other greens or lettuces. I prefer to julienne such greens as lettuce and chard. Once you become adjusted to the flavor of bitterer greens, use them as a base for a lunch salad. Tip: Take a nutritious, thick, and flavorful dressing that will coat and and add substance and heft to these tougher greens. Some ideas include Raw-nch Dressing, Citrus Tahini Dressing, Creamy Cumin-Spiced Dressing (all in LTEV). Think of kale as your new romaine, and these thick, flavorful dressings as your new Caesar! Try Kale-slaw with Curried Almond Dressing, this Spring Kale with Sweet Mustard-Miso Dressing from Christy Morgan. Also, ever try a dandelion greens salad? Now’s your chance, this Bittersweet Salad with Apples and Dandelion Greens from Ricki Heller looks incredible! • Pestos. Pesto is one of my very favorite recipes to make, basil pesto in particular, and usually with cashews, Brazil nuts, and/or walnuts. When basil isn’t as abundant but still available in grocery stores, you can modify your pesto recipes by substituting spinach, or even Swiss chard, for some of the basil. While I’m not generally a fan of a pesto made entirely with spinach, some partial substitutions work beautifully, along with earthy nuts such as walnuts or pecans. My Spinach Herb Pistachio Pesto (also in LTEV) has become one of my favorite pesto creations. • Brief Cooking Methods. Most greens benefit from only very brief cooking. Overcooking turns their vibrant green to a murky green-gray color, and also changes the flavor. I prefer the color and flavor of greens when they’re cooked quickly, just to wilt and warm through the greens. Greens also lose some of their nutritional value with prolonged cooking, so brief is best, especially for more tender greens such as Swiss chard and spinach, and the leafy portions of such greens as bok choy or beet greens. Sturdier, hardier greens such as collard greens and kale usually take a little longer to become tender and pick up a brighter green color. Here are some ways to quickly warm or heat through greens—remember, cook until the color has just perked up and the leaves have softened; this is when the flavor is best. • Chips. 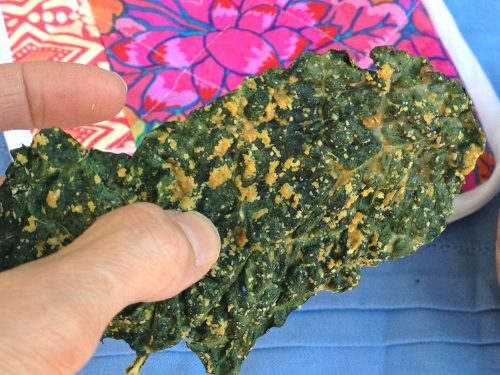 Is it possible to talk about kale without talking about kale chips? I don’t think so. If you have a dehydrator, you have many recipes to choose from. These Sun-Dried Tomato Cheezy Chips from Oh She Glows look crazy-good. Don’t have a dehydrator? Try my “Oven-Dehyrated Kale Chips“! • Sautés and Stir-Fries. Adding some chopped, torn, or julienned greens to a lightly oiled pan (or with smidgen of water), with a touch of salt, pepper, and a little grated or minced fresh garlic, shallot, and/or ginger, if you like. Let the greens soften into the oil over medium heat for a few minutes (just a minute or two for delicate greens such as spinach, longer for tougher greens such as kale). The leaves wilt down considerably, so you may want to use far more than you think! Note that if your greens are still a little damp, you will not need to add much/any water. And, keep in mind that the greens will also release some water as they wilt. 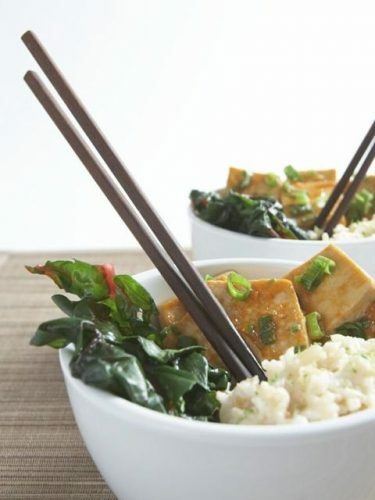 Other seasonings you can add: splash of tamari or coconut aminos, squeeze of fresh lemon juice, zest of lemon or orange, tiny drizzle of pure maple syrup (just a 1/2 – 1 tsp to finish greens, if they taste slightly bitter to you), drizzle of toasted sesame oil, few drops vegan worcestershire sauce, etc. Try this beautiful African Collard Stir-Fry for an exciting flavor twist! • Soups and stews. Many soups offer the perfect opportunity to get greens into your meal. Consider the stew you are having, and whether the flavors or ingredients would suit adding something like Swiss chard or collard greens. If so, add them just before serving, letting them wilt ever so slightly into the hot soup, and then serve immediately. As mentioned, brief cooking can improve the flavor and texture of greens – overcooking can ruin flavor. Try Beans ’n’ Greens Soup from LTEV and also many other soups and stews recipes. Try this Black-Eyed Pea and Collard Greens Chili from JL goes Vegan! • Pasta. Much like soups, pasta can be even more delicious with the addition of some greens—especially if the pasta has a generous sauce just looking for something to cling to! Again, add close to serving, tossing the greens through the finished pasta and sauce to warm through. Try the wilted greens option in Tomato Artichoke Pasta in LTEV, for instance, or with other pasta sauces that you love. Even a simple marinara or jarred tomato sauce can be tossed through hot pasta with julienned greens to wilt pasta down before serving (and I must mention that Brazil Nut Parm would top the dish off splendidly)! And, how about lasagna with greens? Look at this magnificent Vegetable Lasagna with Kale from Manifest Vegan. • Grains and Beans. Whole grains and beans offer endless possibilities to incorporate greens. When hot, you can easily mix in chopped greens and they will almost instantly wilt from the heat of the grains or beans. Add a punchy sauce or gravy, and dinner is ready! And, you can make beautiful and impressive grain and bean dishes utilizing greens, like this Lentil-Kale Risotto, these White Bean, Spinach and Walnut Phyllo Rolls, or these Dolmades, Deconstructed (such an inventive lady, that Ricki Heller)! • Steam. Greens can be steamed in just a matter of minutes, and then are particularly delicious topped with some kind of sauce, such as a tahini sauce, Moroccan Carrot Dip or “Raw-nch Dressing” (from LTEV), or Creamy Curried Almond Dressing. • Wraps! Sturdy leaves like kale and collard leaves make beautiful and nutritious ‘wrappers’ for all sorts of fillings, like these Chickpea Salad Rolls. I like to use them raw, but you can also very lightly blanch them – just for a few seconds – and then shock them in cold water to stop the cooking. And, crispy, smaller lettuce leaves (including endive) also make great “boats” for fillings. 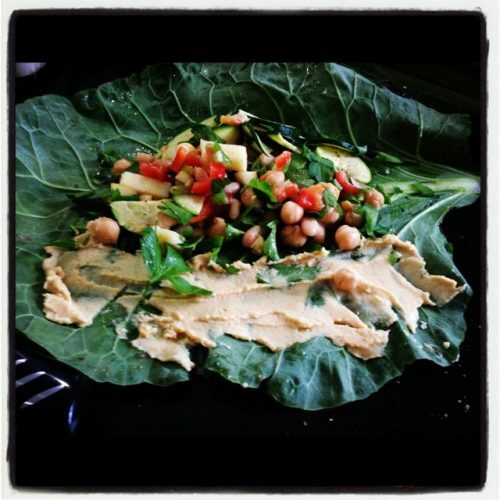 You don’t have to wrap the leaves around the fillings, simply add spoonfuls of fillings and pick up to eat! Maybe you need some video-inspiration? 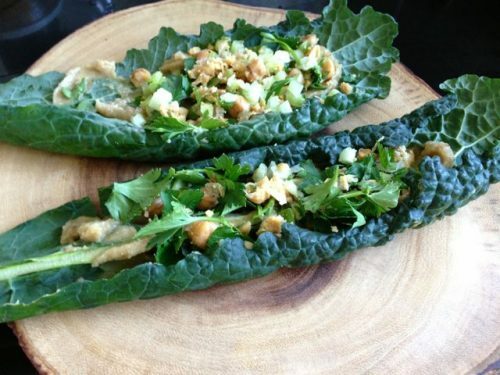 Watch Jaime make Marinated Mushrooms and Kale with Walnut Cheese on Save The Kales. As I always say about eating new healthy foods… keep on keeping on! You will get the leafy-green-vibe, sooner or later! This article was written by vegan author Dreena Burton of Plant Powered Kitchen. Check out her site for more incredible articles, guides and recipes, as well as her new ebook, Plant Powered 15, and her other amazing books.